Zhuji Mingdao Mechanical &Electrical Co.,Ltd establish in 2003 year,located in chinese embroidery machine capital-Zhuji,Zhejiang.It is a high-tech enterprise incorporating the development,production,and sale. Since our company was founded,we always carry out“integrity,pragmatic,innovation”as enterprise tenet. Our company take the road of independent development had developed many serial products rely on advanced production technology and strong technical force.Now our products are sold throughout the country as well as Pakistan,India,Bangladesh,Saudi Arabia, Jordan,Egypt,Indonesia and other countries.They are favored by our customers. We will constantly adhere to technological innovation. 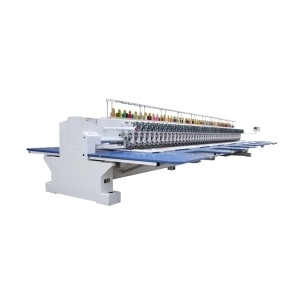 we sincerely hope that we can widely cooperate with friends in all circles at home and aboard to move forward hand in hand and create the embroidery machine's bright future. Company Zhuji Mingdao Mechanical&Electrical Co.,Ltd.